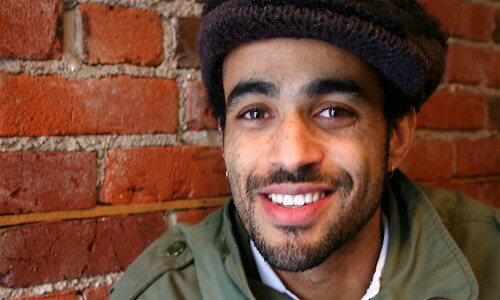 I interviewed Sol Guy, the host and producer of the television series 4Real – a show that highlights young people around the world who are using art and culture to deal with pressing social issues. Several shows are already in the bag, with the likes of Joaquim Pheonix and K’naan, with more to go before it goes to air this fall on MTV Canada. All you need to know is here in the inverview, so check it out over at Capital Magazine. I am most excited about this so my dad can see that I am actually doing things out here in Vancouver – top of the fold Pappy! NowPublic is a participatory crowdsourcing news organization that is based here in Vancouver. I like writing for this news network, believe in their goals, and think it’s pretty damn cool I ended up in the British Columbia section of today’s Globe and Mail because of my contribution. Find out more about NowPublic and join the masses. 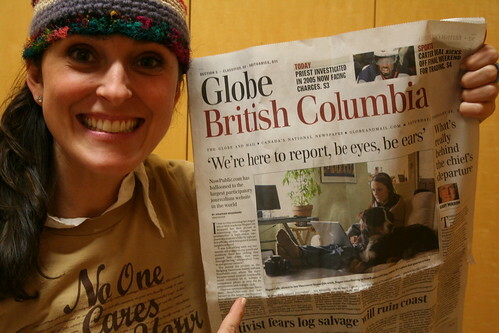 If you’re in BC, there happens to be a photo that goes along with this article where I managed to get my dog Capo another step closer to being the most photographed dog on the planet! CNMA Shares A Few Pictures On Flickr! Flickr is one of the best photosharing sites on the planet, not to mention, all over the internet! The Canadian New Media Awards has joined the masses and set up a new flickr account to share photos from years past. Check out some of the pictures added from the awards show in 2005 and 2006. This will be one of the places online anyone can upload their CNMA pictures for this year’s show in Toronto this May for all to see and experience. You’ll be able to check out the Who’s Who of new media in Canada and download any photo from the site as well. 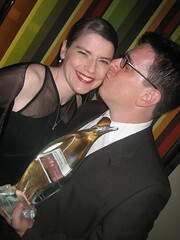 Get caught up on the CNMA Blog and submit a nomination for the 2006 award show now! Lost: The Sequel? From The Beaches Of Vancouver? Seeing movie trailers, cables, cameras, lights and crew members with walkie-talkies in hand has long been a common occurence throughout the streets of Hollywood North. Every person living in Vancouver has either been on a movie set or knows someone who is “in the business”, so this ain’t no novelty. The film industry in Vancouver has had its’ fair share of ups and downs, but this set was a strong reminder, and was as in-your-face as it gets, that movies are made here: Made In Canada. And Vancouver’s sophisticated film studios and flexible outdoor backdrop aren’t just attracting feature films. The television series Smallville has long been a Vancouver-shot mainstay. Anne Heche’s new series Men In Trees resides here as well. And let’s not forget the days of X-Files, Dark Angel, X-Men, the list goes on and on. From the BC Film Commission list, there are currently 9 features, 12 televisions series, 5 MOW’s, 3 short films, 8 animations, 3 documentaries, and a handful of pilots and mini series. And this is the SLOW season! So for all of us in Vancouver, when we’re slaggin’ the back-up of traffic and the no parking zones due to movie trailers and film sets, smile and remember that this industry keeps many Canadians employed and north of the border. 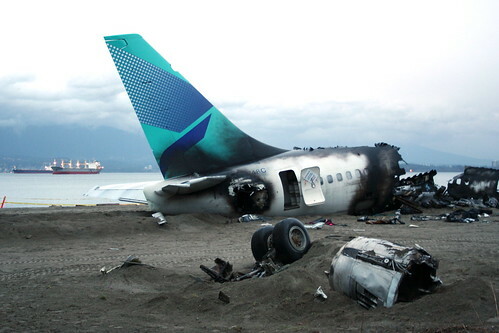 And, hey, one of these days you may get lucky and stumble across a gnarly plane crash, or two. I hope I never get that close again. ONLY 2 WEEKS LEFT!! Submit a nomination for the Canadian New Media Awards 2007 by clicking here. Brooke Burgess | Executive Producer | Budget Monks Productions Inc.
Tim Willison | Interactive Engineering | Organic Inc. The prestige of winning a CNMA gave me the recognition instrumental in launching my career forward. No other award I’ve won bears quite the same weight. Norma Penner | Senior Contributor Designer | Organic Inc.
Northern Voice 2007 is fast approaching, and from the look of things over there, only 20 spots remain. This will be my first year attending. This time last year, I was held up and buried in a Broadcast Centre in Torino. Albeit, Italy won out over NV then, but this is now, and I’m excited to suss this out this blogging, podcasting, videoblogging conference – I’ve heard so much about it, this conference for the commoner? Register: it’s cheap, should be grand fun, and there’s a purple T-shirt in the loot bag. That’s the real reason why I’m going. My friend and guru blogger, Darren Barefoot, is conducting a wee online survey: Why blog? Why do YOU blog? Wait, what’s a blog?